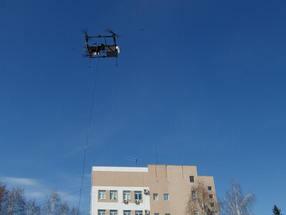 Scientists of Samara University have tested 'flying laboratory' in field conditions. The device is placed on the platform of an unmanned aerial vehicle (UAV) of the multi-rotor type 'Indigo', developed by the engineers of the University Centre for Unmanned Systems. The basis of the airborne laboratory complex is the gas microchromatograph, developed by the scientists of Samara University. The portable device weighs a little more than a kilogram and it completely replaces bulky laboratory devices. It can provide accurate data on the composition of the atmosphere, qualitative and quantitative composition of oil and gas, as well as analyse biomarkers in exhaled human air within a few minutes. The device is placed on the platform of an unmanned aerial vehicle (UAV) of the multi-rotor type "Indigo", developed by the engineers of the University Centre for Unmanned Systems. The air chemical laboratory is capable of performing an operational analysis of the state of the atmosphere at altitudes of up to 1000 meters and within a radius of 2 km from the source. In an autonomous mode the complex can fly around potential sources of air pollution along a pre-compiled route with designated emission points, analyse the air composition and transmit the received information to the ground control centre. The process of analysing the obtained samples takes up to three minutes. The device can also quickly record and track the level of concentration of substances in the air at different altitudes and remoteness from the source. This will allow to predict the direction of the spread of pollution in the atmosphere more accurately. The mobile laboratory complex can be used primarily by oil and gas, chemical and energy companies, as well as other industrial enterprises, whose activities are associated with potential emissions of toxic substances into the atmosphere. In addition, the device can be successfully used in emergency situations: when it is required to make a large number of measurements at several points in order to obtain a reliable picture, and access to the source of pollution is difficult. "Sampling for air analysis is often associated with the risk to the life of experts, as the toxic release sites are located at a decent altitude - on the upper tiers of production plants or on pipes. The mobile device will allow to carry out the analysis "here and now" and will secure the expert's work," - explains Vladimir Platonov, one of the developers of the gas microchromatograph, Associate Professor of Department of Chemistry in Samara University. According to the scientist, no less important is the fact that the sampling must be done directly at the site of the maximum concentration of toxic substances. If one takes them above or below the emission point, the results will be incorrect - the substances will be blown by the wind. "Traditional analysis implies multi-stage: sampling, transportation, depreservation and only then - the analysis itself. In this case, the correctness of the research is not guaranteed, because when the samples are brought to the laboratory, the expert often does not even know the conditions, in which they were collected, - says Vladimir Platonov, explaining the methodology. - When using our development, the sampling is carried out directly in the focus of the maximum concentration of toxic substances and the error is leveled out." Samara University.